BlackBerry 10 is launching in just a couple of weeks in what is expected to become one of the most important events for RIM and possibly for the mobile landscape this year. With leaks here and there we pretty much know what to expect, but now as the platform nears its release date we get to see even the specific apps. Now, courtesy of BB10Believe, we get an inside look at the voice control, maps and clock applications in BlackBerry 10 and all their capabilities. First, voice control on BB10 will serve basic functions like calling or texting someone via your voice, a feature that sounds useful if you are in a car. However, the voice search is not intelligent in the way Apple’s Siri or Google Voice is. It is a barebones voice app that accepts commands and little else. Language support is also limited, but we’d rather wait until the final release to see what exact languages will it run on. Next, we have screenshots of the maps application. The focus here falls on simplicity and fast loading times, and you’d be able to mark favorite places, but little else is known besides that. Finally, the clock application is also straightforward with a clock, timer, alarm and stopwatch. Also alarm and clock are both sharing the same screen making it a bit faster to set alarms. 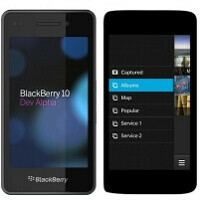 All of the apps have the black and grey looks of BlackBerry 10, with simple and functional design. Take a look below. zOMG!!!!!!!!!! Wait, what am I excited about? Hm...won't be pessimistic but there's nothing new that i can look forward to. What i'll look out for, is the news for fluidity and user friendliness. Nice and Clean !!! waiting for you BBM 10!! i like the look of the clock and alarm apps. for those who already "trapped" and "caged" on BB, this device is a great leap forward, at least in Afrika, India and Indonesia, the most BB user still exist.